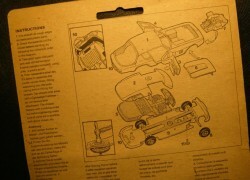 Item description: Produced in limited numbers, were the Dinky Toy range of build yourself ‘Action Kits’. 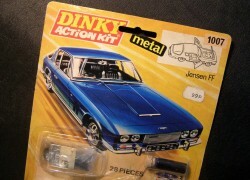 The Jensen FF ‘Action Kit’ was numbered 1007, and contained all the parts, shape plastic packed onto a card backing. Included in the kit was a vessel of blue enamel paint, enough to paint the model. 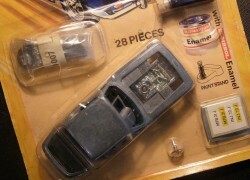 The reverse contained instructions on building up the kit. Very few of these survive in un-made complete condition, and hence are a rare find in todays market place. Condition report: Close to mint condition, with storage age only. It should be stressed that the value in the ‘Action Kit’ is the fact it has survived un-made, any attempt to open the kit will instantly devalue it. Background to Dinky Toys: Dinky Toys are die-cast zamac miniature vehicles produced by Meccano Ltd. Dinky Toys in England were made between 1935 to 1979. The factory was at Binns Road, Liverpool, England. 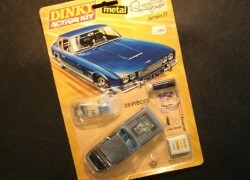 Arguably, Dinky Toys (possibly as well as Solido), were the most notable diecast vehicles ever produced.